See this post for some more useful sites. Here is a compilation of websites that I recommend checking out. Feel free to post a comment with questions or suggestions. Not everything on every site is good. Use your common sense. List of sites can be found on the side of this site. Amazon - Great shopping site! Read my review. Newegg - Good for electronics. Ebay - Gift cards, unusual items, used items, etc. Read my review. Craigslist - 2nd hand things for cheap, especially furniture. Epinions.com - Reviews on many different items. Kayak- Searches many airlines. If you need a certain schedule, Kayak is great. I.e you can tell Kayak that you want to take off only between 7 and 9 am, or that you need to land at a specific time. STA Travel - Great for one ways and cheap student tickets. Anyone can 'become' a student. Most airlines don't even ask for student ID. They often have great fares. Travelocity -Search engine. Sometimes rates are cheaper than Orbitz and Expedia. Farecompare - Search engine. Can search a full year at a time. Southwest - seems to get skipped out by some search engines. Flightstats.com - Get up to the minute arrival and departure info for any flight. Farecast.com - Will supposedly tell you if fares are going up or down. I wouldn't rely on it too much though. SeatGuru.com - Find out which seats are good on your plane. Car Rentals - Read my review. Priceline - Read my review. Hotels.com - Rates are usually not that great. Tripadvisor - Reviews about all hotels. Lifeline - $1 a month phone line. Read my review. Grand Central - Free virtual phone line. Read my review. Gizmo Project - Free international phone line. Read my review. Sprint Sero Plan - Cheap cell phone plan. Use email address savings@sprintemi.com. Review coming soon. T-Mobile Prepaid - Best prepaid rates. Read my review. Amex Cards - Read my review. AA Credit Cards - Great for those who want to churn credit cards. No limit to the amount of times you can apply for the same card. Miles from Credit Cards are elite qualifying miles. Review coming soon. Annualcreditreport.com – Free annual credit report. Read my review. Slickdeals.net - Great deal forum, large active community. You need the patience to read through all the comments. Fatwallet.com - Another great deal forum site. Great for financial issues. Flyertalk.com - A forum for travel related deals. These sites offer you cash-back if you click through their site before shopping. If you are not going to sign up with one of these sites, then please support this site by clicking through my links instead. 1- No listing fee, you only pay when you sell. 2- Item often sells for more on Amazon then on Ebay. 3- Amazon is more secure. Usps.com - Carrier Pickup. Read my review. Paypal shipping - Allows you to print Parcel-Post labels. Amazon has these household items on sale. All come with free shipping on orders over $25 or with Amazon Prime. GPS units have been going down in price quite a bit the past few weeks... The prices change quite often, sometimes a few times a day! If you need one now, I would recommend buying a Garmin on Amazon. I’m recommending Amazon, besides for the fact that they have great prices (Click here to read more about Amazon) but also because if the price drops within the next 30 days you can get the difference refunded quickly and easily by sending Amazon an e-mail. Practically speaking, even if the price drops way past 30 days, you have pretty good chances of getting refunded from Amazon as well, though then you would want to speak with Amazon on the phone instead (have Amazon call you). I'm recommending the Garmin's because they are great GPS units. Prices keep on changing, so add item to wishlist or check back for price updates and get refunds. I have the 660 and am very happy with it. The drawback with these Garmin’s is that they don't include European maps. Some of the more expensive Garmin’s do come with European maps preloaded (270 - $316.99 or the 670 - $379.59). Also, these don’t tell you the address where you are currently located. Some other GPS units can do that. Garmin Nüvi 660 - GPS Navigator $329.99 - Free Shipping! 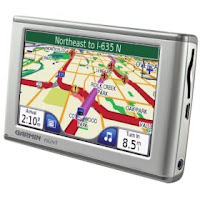 Amazon has the Garmin Nuvi 660 4.3-Inch Widescreen Bluetooth Portable GPS Navigator for $329.99 - Free Shipping! If you are in the market for one of these, this is an amazing price! The price on Amazon for the past few weeks was $369.99. Grab one before it sells out! Dell small Business has the Kingston 2GB USB Flash Drive for $6.71 with free shipping. Teva Women's Volterra -$9.90 -Free Shipping! Teva.com has the Teva Women's Volterra for $9.90 with free shipping. Do you ship packages but can’t stand going to the post office and waiting an hour or more? This USPS.com ad says it all: You have places to go and people to see and none of them are at the post office! Try using Carrier Pickup. You enter how many packages you are going to be sending and a Postal carrier will pick up your packages on the day you request. Parcel Post is the cheapest, but can take a long time to arrive. Priority Mail usually arrives within 2-3 days. In order to request Carrier Pickup you 'officially' need to be sending at least one of the packages Priority Mail. Unless the package is really big or heavy, the cost is similar to Parcel Post. A benefit of Priority mail is that it includes Delivery Confirmation (Tracking Number). I have found that sometimes Priority Mail can come out even cheaper then Parcel Post, i.e. a small heavy item that fits in to a Priority Mail flat-rate box. I recommend using Priority Mail unless Parcel Post is much cheaper. You can use Carrier Pickup without printing out any labels from USPS.com. You can use labels that you have from other sources, e.g a return label from Amazon. The only downside with USPS.com is that they only let you print out Priority Mail labels, not Parcel Post. If you need shipping boxes, the USPS will send you whatever size you want for free, but they are Priority Mail boxes and can’t be used with Parcel Post. Click here to order. Useful tip: If you get a note saying that USPS tried to deliver your package but nobody was home, and that the package can be picked up at the Post Office: There is a number on the back of the note. Call them and ask them to redeliver it, or click here to request a redelivery online.